Ten days after cyclone Vardah travelled from the Andaman Sea over the Bay of Bengal to hit Chennai, we flew backwards along its track. The sky over Chennai was a clear blue. As the plane nosed up, I saw a few banks of fluffy clouds near the horizon. The sky below us was clear as our Airbus 320 reached cruising height. 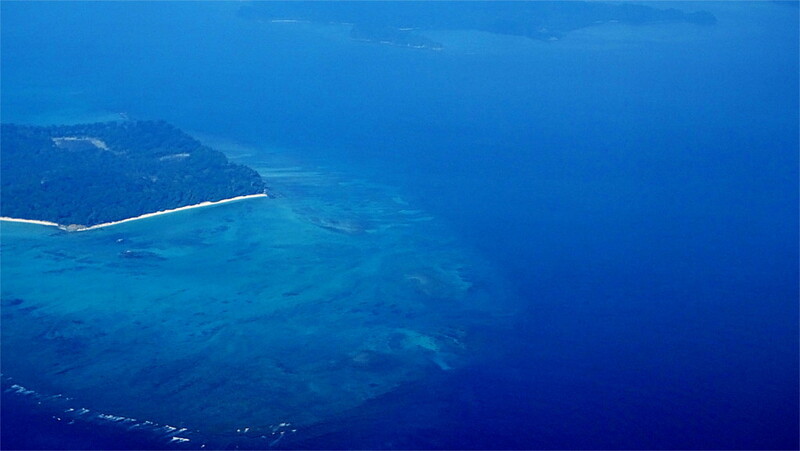 The flight to the Andaman archipelago would take almost two hours. The sky below me seemed clear; only a few stray fluffy clouds occasionally interrupted my view of the calm seas. But when I looked up, there was a thin layer of cirrus clouds very far above the cruising altitude of the plane. They looked dark against the otherwise clear sky. You can see them in the upper half of this photo. 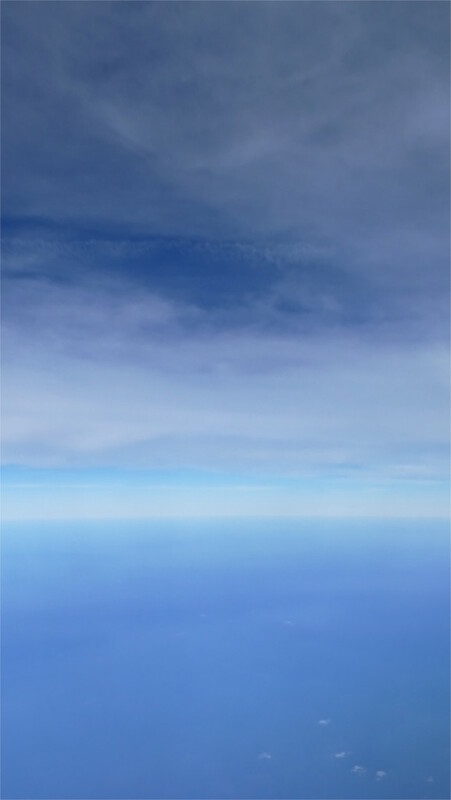 You can also see a few wisps of white cumulus clouds against the blue of the sea in the lower part of the photo. The monotony of flying over the ocean was just beginning to lull me to sleep when the plane began its descent. As we came in over the outlying islands, cloud banks piled up ahead of us. The air was not as clear as it had been before. I realized later that clouds tended to mass up near the islands and coast in this season. As a result, the image of the coral atoll surrounding the island in the photo above was hazy, and I had to tweak the photo quite a bit to see the beautiful patterns in the water around the island. It was lovely to see the surf breaking far from the white sandy beach around the island. The descent to Port Blair was fast, and I barely clicked a few more photos as we came lower. Almost the last photo I managed to take was a beach surrounded by corals. This is the featured photo. The water is so clear that you can see the coral reefs and the wide tongue of white sandy beach. I knew we were in for a great holiday.